Captain Ashley Williams says Wales can cope with the emotion and expectation as they aim to qualify for Euro 2016 on Sunday. Victory over Israel at Cardiff City Stadium will secure Wales their place in next year's finals in France. Wales, who are unbeaten in the qualifying campaign and top of Group B, have not reached a major tournament since the 1958 World Cup. "I am sure we will be ready,'' said Williams. "We have a good group of lads here who are very humble, always work hard, always come in and show the right attitude. "All the distractions and stuff over the past few camps, we have started to get used to that. I think we are used to dealing with it more now." Another fervent full house is expected at Cardiff City Stadium, where Wales have not been beaten in six games, conceding just three goals. Gareth Bale's late goal in the 1-0 win against Cyprus on Thursday has put Wales on the verge of a place in France next year. Williams said the players have become familiar with growing expectations. They are on the brink of an achievement which eluded the likes of Welsh greats Ryan Giggs, Mark Hughes, Kevin Ratcliffe, Ian Rush and Neville Southall. Williams said: "There's a lot going on and we are aware of it. People are excited. People are writing a lot of things, it's everywhere we go." Williams - who has led Wales to ninth in the Fifa world rankings, their highest position ever - added: "We are very proud as a team of what we have achieved already, but at the end of the day we have this end goal, which is to qualify for the competition. "Until we achieve that we are not really going to say or think any other way." 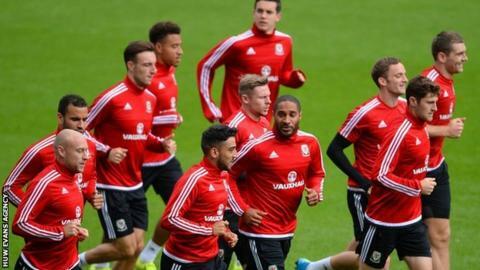 Manager Chris Coleman hopes Wales fans are patient as they enter "new territory". "I just need our supporters to stay with us," said Coleman. "We are having to deal with a new situation, which we have earned. It's going to be a tough, tough game for both teams. "We know what it is going to be like, going to be a fantastic atmosphere - we must not get caught up in it." After facing Israel, Wales complete their group games away in Bosnia-Herzegovina and at home to Andorra in October.